Step 9) Prepare your cheesecloth by soaking it in the RIT fabric whitener (following the package instructions). Hang the cheesecloth and allow it to dry thoroughly – it should now glow nicely under blacklight. Step 10) Now hang your completed frame from Step 6) in the display location and you can string up the ghost. Up to this point, we have followed what many other people have with their flying crank ghosts, but as we looked at all the videos online we didn’t like how all the FCGs just bobbed up and down. 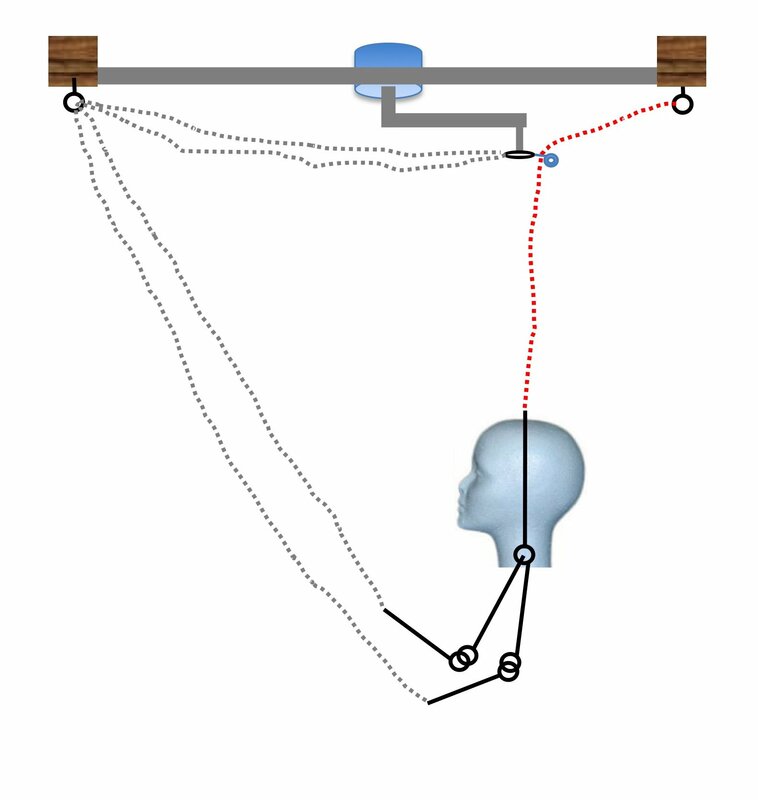 As we looked at the mechanism we realized that one simple change (that nobody else had done) would add another dimension of movement and give the ghost a swooshing movement that causes the ghost to sweep forward and rise before it drifts down and backward. The faster rotation of the wiper motor works well and when combined with a small fan to add movement to the cheesecloth creates an eerie effect. The change we made was to add a pulley to the swivel washer and suspend the ghost directly from the swing arm (the reverse of the standard setup). We found a very cheap pulley at the local home improvement store in the screen door section – a sliding screen door tension roller – it has nice deep track to keep the string on the roller and not let it slide off and the metal tab made for easy mounting. Be sure to use fishing line that doesn’t glow under blacklight – we used 12lb test Spiderwire EZBraid. Hang the ghost by tying one end of the fishing line to the wire hanger on the ghost head, route the line up thru the pulley attached to the spinning washer, and then tie the other end of the line to the wood frame at the rear. This is the dashed red line in the diagram. For the arms, tie the line to one of the ‘hands’ and then route it thru an eyehook on the wood frame and then tie the other end to the swivel washer (you can use snap hook to make the connections easier to remove). Repeat on the other side for the other arm. These are the dashed blue lines in the diagram. Many designs call for small pulleys instead of the eyehooks we used for the arms – since the largest weight is the head assembly we found those pulleys are not necessary. We restring every season and haven’t had a problem, but you could certainly use pulleys if you prefer. After hanging the ghost, you can arrange the cheesecloth however you like it. We opted to create a wispy shroud look for the arms with a more substantial center ‘body’ outline while still leaving the torso very wispy – get creative and try different configurations until you find something the kids like.